If you put together all the chief executive officers from the financial services industry in one room and asked them, “Who looks back on the years 2007 to 2009 with fondness?” it’s a very safe bet that only one hand would be raised. That hand would be on the arm of a man named Gregory Garrabrants. Don’t feel badly if the name doesn’t ring a bell because the institution Garrabrants has run since October 2007, BOFI Federal Savings, a La Jolla, California-based bank, is about as unlikely an institution to have prospered in those years as can be imagined. As banks, thrifts and mortgage-finance companies were busy collapsing or receiving multiple federal bailouts, especially in Southern California (the epicenter of the global financial crisis), BOFI was just beginning an earnings streak that’s seen its bottom line grow at a compounded annual rate of 44 percent since Garrabrants was hired. Those aren’t bad returns for a CEO to deliver, especially for someone like Garrabrants, considering his previous job: chief of business development for IndyMac Bancorp, the fourth-largest U.S. bank to ever be seized. Also not bad: On Oct. 23, 2007, the day Garrabrants’ hiring was announced, BOFI’s closing share price was $1.76 and for fiscal 2008 its net income was just less than $4.2 million. By 2010 it was $21.1 million, with its fiscal year concluding on June 30. Today its share price is almost $24, and for the first nine months of the year the bank has reported income of almost $102.2 million. None of the CEOs at our imaginary gathering can point to results like the stock price performance below: BOFI’s for the last nine years. Though Garrabrants is only 45 years old, his many achievements as an executive would seem to position him at the center of important conversations about assuming a higher profile in his community or within the banking industry and eventually a spot on the short list for CEO roles at money-center banks. But those conversations don’t appear to be occurring, for reasons that are becoming increasingly clear. That’s because Garrabrants is this market cycle’s self-appointed crusader against short sellers. Put bluntly, he really hates them. He hates them so much that he spends both shareholder and personal capital discussing his prediction that BOFI’s critics will be sent to prison (undoubtedly one with “tiny bars“) for allegedly coercing former employees to make false statements that could drive down his bank’s share price. According to Garrabrants, when evidence emerges from BOFI’s lawsuit against former BOFI internal auditor Charles Matthew Erhart — whose October 2015 whistleblower complaint prompted Garrabrants’ recent outburst — it will reveal a “coordinated effort” between the media, short sellers and employees like Erhart. Such allegations recall former Overstock.com CEO Patrick Byrne’s 2005 claims that a patchwork of conspiratorial relationships had created a “Miscreant’s Ball.” While Byrne’s allegations received a great deal of (mostly unflattering) attention for Overstock.com and Byrne in the U.S., when his theory was serialized by his colleague, former reporter Mark Mitchell, it proved libelous in Canada. 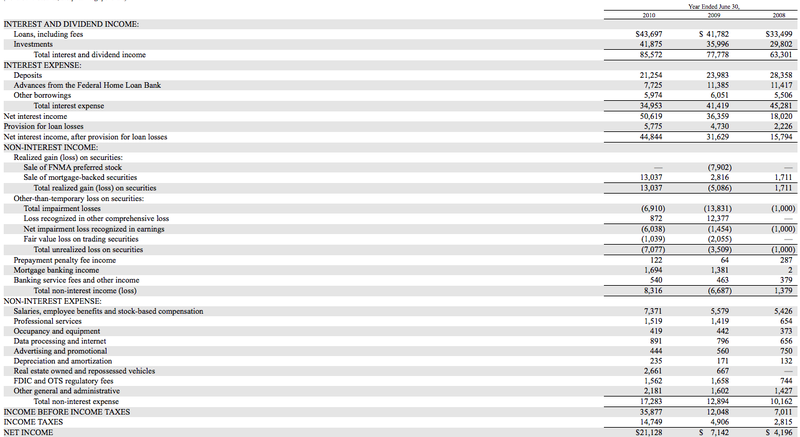 Here’s the thing, though: BOFI is winning handily if its income statement is any barometer. Nor should it go unnoticed that the last Seeking Alpha article critical of BOFI was more than six months ago. 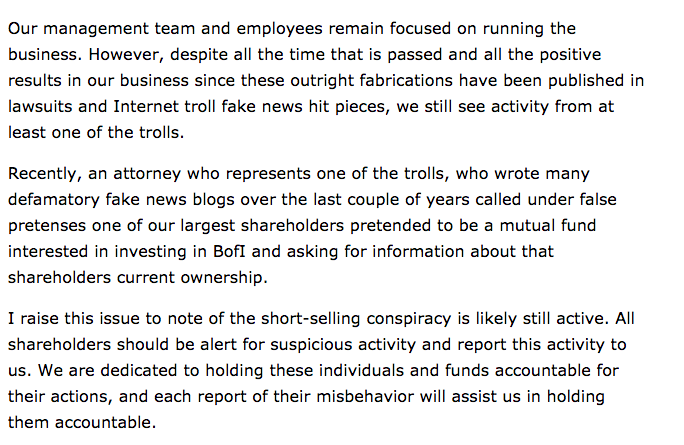 But if some BOFI short sellers aren’t publishing many posts anymore, they don’t appear to have been driven off by Garrabrants’ relentlessly confrontational approach either, judging by the gradually increasing amount of shares that have been sold short. Intrigued by BOFI’s drama, the Southern Investigative Reporting Foundation spent more than a year investigating the bank and our conclusion is that Garrabrants’ obsession with short sellers is entirely justified: Their skeptical articles on BOFI have put the crux of his modern banking miracle at grave risk. From where he sits, anything he and his lawyers can do to distract investors from what’s in the company’s filings is money well spent. What those filings suggest is that BOFI’s business model is quite different from what its management publicly discusses. Moreover, BOFI’s ability to generate the revenue and profits that’s made shorting its shares so painful has less to do with its proclaimed ability to structure mortgages suitable for unconventional but creditworthy borrowers or its deft touch in managing risk than something much more pedestrian: its push into consumer specialty-finance lending. This is a nice way to describe lending to people or businesses whose circumstances make them wholly undesirable as possible clients for even traditional subprime lenders. But as a lot of the CEOs from that erstwhile gathering above would attest to, the first wounds from this type of lending show up on the income statement; the fatal ones are on the balance sheet. To understand where BOFI is going, let’s start with where it’s been. Founded in 1999 as the Bank of the Internet (with an official name change to BOFI in 2011), it is a completely online bank without branches. At the time of its 2005 initial public offering, the bank was profitable, generating a little more than $15.7 million in revenue, primarily via lending to multifamily home builders. Let’s call this the era of BOFI 1.0. Fast-forward two years: Given BOFI’s modest exposure to single-family home lending, the bank was in good shape just as the global financial crisis spread in the autumn of 2007. The newly appointed Garrabrants quickly took advantage of the widespread price collapse of mortgage-backed securities, particularly in the so-called private label market (securities whose principal and interest payments weren’t guaranteed by either Freddie Mac or Fannie Mae) and scooped up hundreds of millions of dollars of these bonds at rock-bottom prices. The timing for this trade couldn’t have been better. As the Federal Reserve and the Department of Treasury pumped many hundreds of billions of dollars into banks and financial institutions, the prices of the bonds rebounded sharply, generating a remarkable windfall for BOFI’s shareholders, with virtually no risk. What’s more, the Southern California real estate market stabilized and loan demand climbed. Call this the dawn of BOFI 2.0. As effective as the mortgage-backed securities purchases proved to be, these bonds have been maturing at a rapid clip over the past three years. This has prompted BOFI’s management to redeploy capital into a market where risk-adjusted returns are now much lower, while shareholders expectations have never been higher. The challenge is real enough for Garrabrants and his competitors: Providing construction loans for multifamily properties isn’t terribly lucrative and currently yields about 4.5 percent. Making mostly 30-year fixed-rate loans for single family homes and apartments is even less lucrative, generating around 3 percent to 3.5 percent returns for BOFI’s established rivals. So what will be BOFI 3.0? The answer is that there are two versions: BOFI’s and what’s in its filings. The bank wants investors to believe that its outsized profits are the result of the willingness of primarily wealthy borrowers (with esoteric financing needs) to pay a good deal more for purportedly fast, expert mortgage service on jumbo loans. Moreover, because BOFI, unlike most of its competitors, doesn’t break out the yields on its various loan offerings, investors have to take management’s word for it. To be fair, BOFI hasn’t given investors much reason to be skeptical. Consider BOFI’s performance in a Bloomberg-generated ranking of banks in the Russell 1000 and 2000 indexes using three criteria: return on equity, return on assets and net interest margin. Out of 272 results, BOFI had the second highest return on equity and the eighth best return on assets. And despite its being an internet bank and having to attract depositors by offering higher interest rates than its traditional brick-and-mortar rivals, BOFI had a net interest margin within the top 20 percent of the banks surveyed. Incredibly, BOFI can do this all with loss reserves of just less than $46 million, or 65 basis points, on $7.02 billion of loans. Using the same universe of banks in the Russell 1000 and 2000 indexes from above, BOFI placed within the top 10 percent of banks with the lowest ratio of reserves to total loans. But how a bank arrives at great results matters. And with almost 76 percent of BOFI’s third-quarter lending income being derived from single- and multifamily real estate, its arriving at a 5.72 percent yield is no light task. A more accurate picture of BOFI 3.o starts with understanding that the Federal Reserve’s policy of gradually increasing short-term interest rates is not great news for the bank since loans for one and five years are about $3.7 billion of its $8.7 billion in balance sheet assets. While the bank has steadfastly refused to confirm to the Southern Investigative Reporting Foundation whether these loans are adjustable-rate mortgages, it’s a reasonable bet that they are. Why should that matter to the fast-growing BOFI’s investors? During a period of rising interest rates borrowers usually want to cap their interest-rate expense and tend to pick a fixed-rate, 15- or 30-year mortgage. With lending now constituting 90 percent of BOFI’s revenue, the looming slowdown in adjustable-rate mortgage-origination fees doesn’t help. An examination of BOFI’s loan portfolio reveals that its growth is now coming from commercial and industrial loans, whose value has spurted 80.5 percent from 2016’s third quarter to March 31 of this year. Getting to the bottom of what drove BOFI’s commercial and industrial unit’s nearly $400 million loan growth is a different matter though. BOFI, to put it mildly, doesn’t give much guidance to investors, but evidence suggests that the company has been aggressively carving out a niche, serving as a lender of choice for lenders of last resort. The banks that BOFI has financed are nonbank consumer-finance operations like Quick Bridge Funding and BFS Capital; they lend — at rates often north of 50 percent — to small businesses and individual borrowers not able to qualify for loans elsewhere. 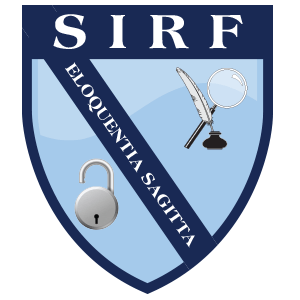 How the Southern Investigative Reporting Foundation zeroed in on subprime lending as BOFI’s new growth engine went like this: In early 2016, a quick search of the electronic court record system PACER and state court records yielded nearly 50 results for BOFI Federal Savings, many for personal or business bankruptcy cases, as well as claims of default. Why would a relatively small bank outside San Diego be listed as a creditor in bankruptcy claims for a New Bedford, Massachusetts garbage disposal company, a Dumont, Iowa truck driver and a Farmers Branch, Texas imported car showroom? So despite most bankruptcy filings being about 60 pages of deadly boring, bare bones reading, after the Southern Investigative Reporting Foundation studied the initial 50 BOFI-related cases, and having interviewed 18 of the individual filers, it appeared that BOFI is a central cog in a growing lending business that few have known about, let alone understood. What is this new lending business? A legitimate receivables factoring transaction involves a factor carefully scrutinizing the quality of the receivables and the borrower’s cash flow cycles; the word “careful” is not reflective of how these BOFI-backed “working capital loan” and “business funding” operate. With the ability to fund loans in a week or less, these lenders can quickly structure a $10,000 cash advance in exchange for the purchase of $13,500 in future receipts. Crucially, the lenders require access to a borrower’s primary business checking account, using the automated clearing house system to draft weekly — and sometimes daily — withdrawals of a fixed amount of principal and interest. If the weekly withdrawal doesn’t go through, a series of steep fees and interest rate penalties are assessed. Most borrowers with whom the Southern Investigative Reporting Foundation spoke to described the process of repaying this type of transaction as incredibly difficult, considering the typical 40 percent interest rate. And when penalty fees and the like are assessed, the rates can be 50 percent or more, forcing many borrowers to seek relief through bankruptcy. It’s fair to ask hard questions about these borrowers and what decisions led to their inability to repay loans that they entered into willingly, despite the steep terms. An equally valid consideration is why BOFI-backed companies willingly competed to lend these troubled borrowers large sums of money, despite many dozens of documented prior bankruptcies, collapsed businesses and mountains of prior debt. One thing is clear: This kind of lending, however distasteful, is perfectly legal. More important, it’s very lucrative. This is the world of BOFI 3.0, the Bank of the Internet’s lightly disclosed transformation into the Bank of Misery. BOFI’s foray into this type of lending is centered on something often described as “rent a charter.” It’s exactly what it sounds like: making loans to a borrower for an institution that doesn’t have a federal banking charter. While this is an idea that has been around for several decades and is often frowned upon, it’s a completely legal win-win for all involved. This would appear to be a nearly risk-free transaction for the bank that generates perhaps a few thousand dollars of revenue per loan; at the very least, it’s nothing that would upset a curious investor. But there’s a hook, and as these things go it’s a damned big one. What BOFI does is not at all like the easy, two-step process described above; it appears that in many instances BOFI lends the money to BFS Capital and Quick Bridge so they can purchase BOFI’s loans to a borrower at par value. Whatever BOFI’s precise role in this marketplace is, and it appears to be a gnarly mash-up of secured borrowing as well as both lender and vendor finance, it’s not as passive a process as it’s made out to be. Nor is the business line that BOFI now calls “lender finance” as risk free as claimed. The trustee alleged that BOFI and Quick Bridge conspired in a “blatant and transparent attempt to evade [New Jersey] usury laws, [Quick Bridge] engaged in a ‘rent a charter scheme’ by retaining BOFI, a federally chartered bank, to originate the [Quick Bridge] loan.” More broadly, the claim alleges that the repayment terms proved so onerous that much in the business plans that the loans were supposed to pay for had to be scrapped, and a vicious spiral developed, with the company taking out second and third loans to remain current on its prior loans. Repayment was via an automated clearinghouse withdrawal of $1,372.38 for 126 consecutive business days. At the time of Lam Cloud’s bankruptcy filing, $51,658 in principal and interest payments were unpaid. On May 19, the trustee filed a notice of settlement with the court; BOFI and Quick Bridge agreed to pay $30,000 and drop any claim related to the loan. For its part, BOFI’s spokesman Stuart Pfeiffer disagreed mightily when asked if the Lam Cloud settlement could serve as a precedent for borrowers or trustees to potentially sue BOFI in other bankruptcy cases. In a follow-up statement, the bank said that negotiating a settlement before a response was due saved a great deal of money in legal fees, while drawing attention to the language of the consent order, which said both BOFI and Quick Bridge Funding “informally” denied “any liability” against the trustee’s allegations. Time spent studying the ecosystem of these loans, the lenders who make them and the borrowers who affix their electronic signature is an immersion in the rich broth of contemporary American failure. The answer is it depends on whom you ask. The recent career of one Mehrasa “Tony” Khodaverdi, a businessman in the Houston suburb of The Woodlands and the owner of Verdi Enterprises, a clothing, shoes and handbag wholesaler, who borrowed $35,600 from BOFI in Feb. 17, 2016, could lend validity to the theory that there are different interpretations of “collateral” and “credit review” in circulation. On Feb. 24, 2016 BOFI assigned the loan to BFS Capital. (In many filings BFS Capital is listed under its trade name, Small Business Term Loans.) Despite his having made payments for 11 months, Khodaverdi defaulted in January with $25,341 left on the loan, according to a claim the lender filed in Montgomery County court on March 30. The loan was unsecured, which was an unusual approach for BOFI to take, given the fact that Khodaverdi had filed for bankruptcy in 2008, listing more than $1,060,000 in debts against $70,325 in assets. Moreover, in June 2013 he had been arrested and charged with felony aggravated assault. Every lender expects some delinquencies and losses. According to Wallethub.com, the national credit card charge-off rate last year was 3.17 percent of all balances, down from 9.40 percent in 2009. But Khodaverdi’s bankruptcy claim is no outlier. To date, about 70 of these are connected to BOFI but the figure is growing as filers and defendants confirm (through documents) the bank’s role as a loan facilitator through a warehouse facility or so-called rent-a-charter activity. According to BOFI, the Lender Finance business is akin to financial alchemy: a growing hill of troubled loans doesn’t ever touch BOFI—not a single penny of loss–while simultaneously being a dynamic profit engine whose prospects are bright. If all this were not baffling enough, things got kicked up a notch when the Southern Investigative Reporting Foundation came across a motion filed in California Superior Court that Momentum Business Capital, an independent sales organization, brought against Quick Bridge Funding as part of a broader contract dispute. 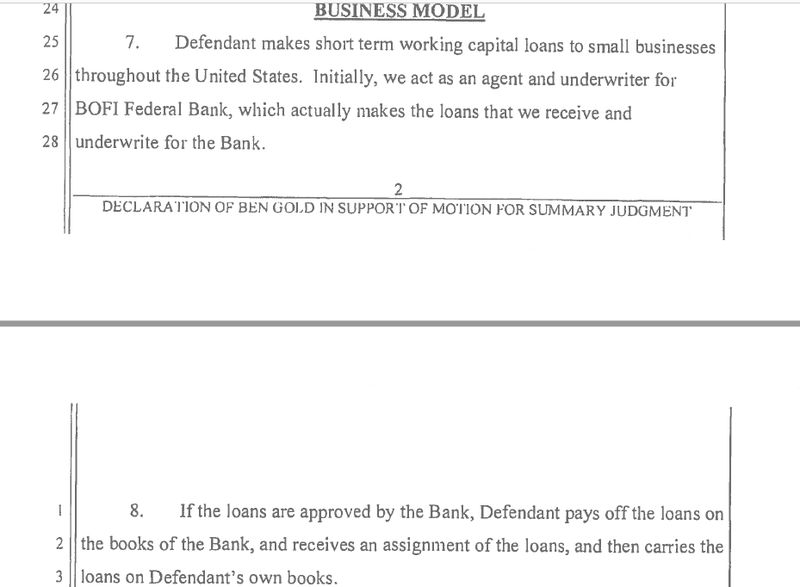 In the motion filed on June 5, one of the exhibits contained a declaration from Ben Gold, Quick Bridge Funding’s co-founder and president, who, when asked to describe his company’s business model, said his company “acts as an agent and underwriter for BOFI Federal Bank.” This would appear to suggest BOFI is his company’s sole source of loans. Similarly, at the end of the document is a very brief excerpt from a deposition of Quick Bridge’s chief executive officer, David Gilbert, who said that BOFI prohibits his company from selling loans to third parties. So while these are only snippets submitted by one side in a legal argument, the Gold and Gilbert interviews have profound effects for BOFI, if either regulators or their auditors read these documents. Let’s boil a brutally complex issue down to its essence: BOFI has promised, at length, that its balance sheet shows none of the credit risk associated with these often troubled loans because they’ve been sold to a business partner. Gilbert’s deposition throws a big wrench into this argument. What lies at the bottom of the Pandora’s box of accounting “what ifs” that Gilbert’s remarks opened up? 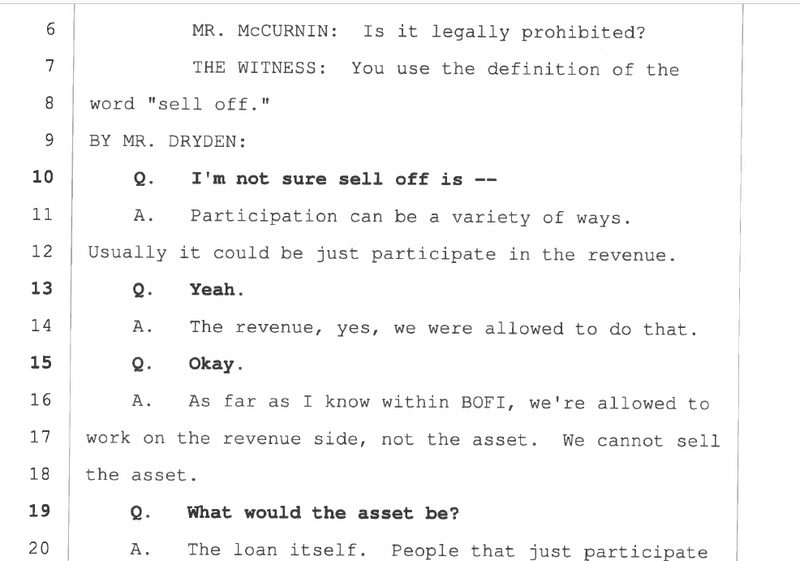 Gilbert’s testimony about restrictions on selling and profiting from the loans implies they shouldn’t be accounted for using what PriceWaterhouseCoopers calls “sale accounting,” meaning that in some measure, they would have to be accounted for on BOFI’s balance sheet. Very few investors want a bank that has a balance sheet with millions of dollars worth of loans to Mehrasa Khodaverdi. The Southern Investigative Reporting Foundation asked BOFI about Gilbert’s testimony in the deposition and the possible risk to its business. That may be true, but the accounting rules, as laid out by the Financial Accounting Standards Board’s Accounting Standards Codification 860, don’t appear to support the argument that loans in a “bankruptcy remote, special purpose entity” are completely free of BOFI’s influence. Let’s put on the green eyeshades, briefly. 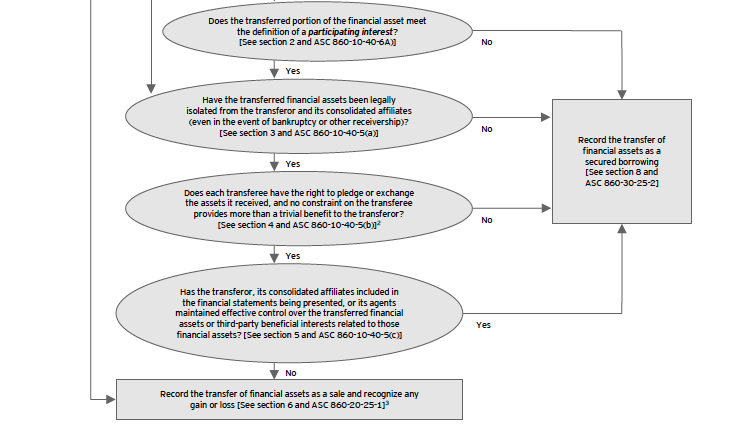 Last August Ernst & Young publicly released a lengthy document, Transfers and Servicing of Assets, that while a soul-crushingly dull read, does have an enlightening section about a “decision tree” that can guide accountants when addressing such issues. BOFI investors should settle down and get comfortable with the BFSes and Quick Bridges of the world, since the bank is making a big commitment to what’s called “the lending marketplace,” a series of lending platforms that seek to connect pooled lenders and borrowers. To that end, in April the bank extended a $400 million loan to Victory Park Capital, a private equity firm whose portfolio includes numerous investments across the subprime spectrum, including AvantCredit, Borro, Kabbage and FastTrak Legal Funding. The Victory Park Capital loan appears to have been secured by holdings in several Victory Park funds, according to Uniform Commercial Code liens that BOFI filed (see pages 55 and 56). Richard Levy, Victory Park’s general partner, didn’t respond to several emails seeking comment.